Students can practice writing upper-case and lower-case letter A and then color in the alligator, apple, and giant letters. Students will have fun making a letter A hat! 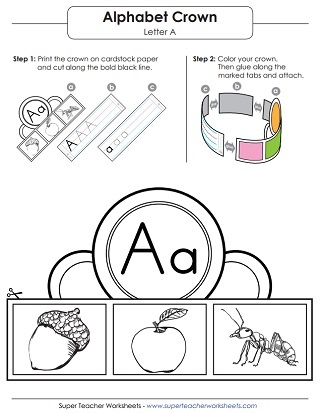 They can practice tracing the upper and lower-case letter A and then color in the acorn, apple, and ant. Trace the dotted lines to practice writing the lower-case letter a and other words with "a" in them. Trace the gray lines to practice writing the lower-case a. Trace the gray lines to practice handwriting for the upper-case letter A. Practice handwriting and learn the capital letter A by tracing the dotted lines. 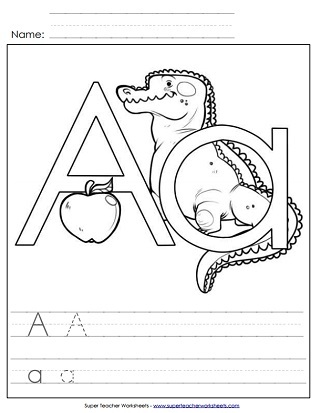 The activities on this worksheet will help students recognize the letter A a. Use an ink bingo dabber to place dots in the circles. The circles make the shape of capital letter A. This page has letter recognition, tracing activities, and printing practice for each letter of the alphabet, A through Z.